Jaarbeurs IT Media is a marketing partner for IT suppliers and a knowledge partner for IT professionals and IT managers. We inspire, motivate and couple demand with supply by facilitating valuable networking opportunities. Jaarbeurs IT Media brings IT suppliers and service providers into contact with desired target groups and informs IT professionals and decision-makers about IT solutions and services relevant to them. We do this 365 days a year via a multimedia portfolio. Jaarbeurs IT Media. Gets IT moving. For every problem a solution and for every challenge a strategy. Whether you want to increase your brand awareness, generate leads or you are in search of new talent. 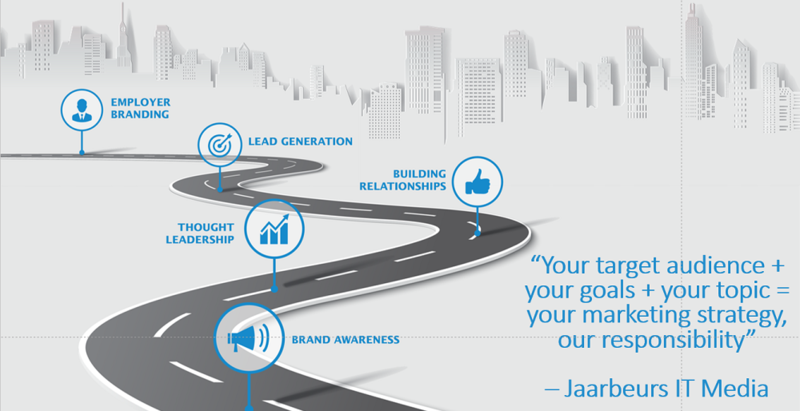 Jaarbeurs IT Media is a reliable knowledge partner for all your marketing campaigns. From the first meeting, we offer input into shaping your marketing strategy and we help you establish and maintain contact with your target group in appropriate way all year round. Because by enabling contact, we facilitate valuable meetings and promote trade. Both online and offline, 365 days a year. At Jaarbeurs IT Media, we are focused on growth. Growth for our clients and growth for our employees. We work hard every day to achieve our clients’ objectives. We take responsibility for our work and act with integrity. As a team, we are proud of what we do and we enjoy working for our clients every day thanks in part to our engaged and positive team spirit.